The Tipping Point of the War on Women? I’m a little slow in getting to this (just back from vacation) but am no less amazed by my sisters in Texas and their “people’s filibuster.” Â With their bodies and their voices they refused to let the conservative legislature pass a bill on July 25th that would have drastically curtailed access to abortion in Texas. Â This is what nonviolence looks like, what democracy looks like, what direct action looks like. Â Truly amazing. I’d love this to be the tipping point of the War on Women, the point where women stand up and say “no” to efforts to limit our rights, the moment when America’s women finally say “enough!”. Â The oppression of women will end at the moment we decide to end it. We are many and we are powerful. Â I hope these activists come back with double force on July 1st when Rick Perry again attempts to pass the bill through a special legislative session. 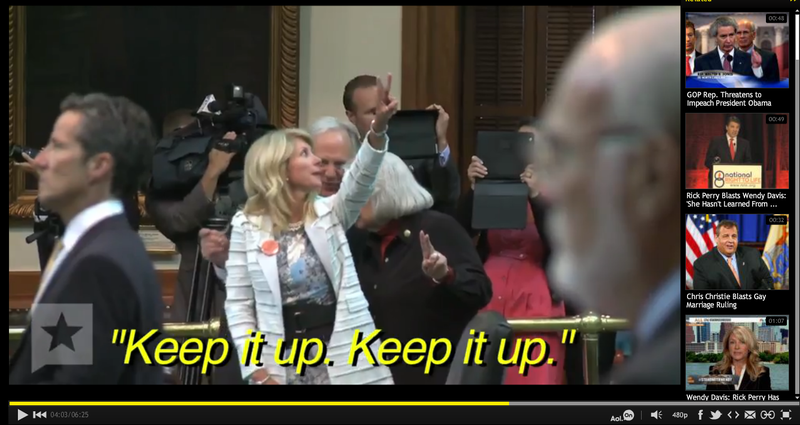 Senator Wendy Davis, who started the filibuster on the Senate floor, encourages the activists in the gallery who were shouting down an attempt to vote on the bill. I can’t seem to embed the link to the above video from HuffPo (the best video on the topic), so click the image to view the video on the HuffPo site. UPDATE: Â I found a video of the “people’s filibuster” shout-down of the vote. Â (Yes, blocking a legal process that is not democratic is a democratic act.) The source of the video is a nice post from Mashable on the importance of new media in the action.